Chris Zwierzynski, from Tripbase.com shares some expert advice on roadtripping. The very first road trip dates all the way back to the time of the Egyptian pharaoh Ramses II and so occurred because he took it upon himself to ride his chariot over the course of a single night, on the way back from Memphis. Imagine how far that must have been when you’re not in a car or plane, but just being pulled along by some horses? That was one determined road tripper. Perhaps even ever since that time, road trips have long become a nigh-on integral part of the human experience, with many a person taking time out to carefully plan, strategize and execute fantastic road trips of their own. Sometimes, people even embark on road trips with little to no planning whatsoever, leading to a spontaneous burst of road trip-related freedom, but a nevertheless thoroughly enjoyable and life-enhancing experience. Carl Jung, that most famous of thinkers, even stated that the humble road trip was a “persistent element of human culture”; a sentiment that I – for one – tend to agree with, especially after seeing the prevalence of road trips in modern society these days. That and they’re awesome fun, of course. Whatever you might think about road trips in general, it is an inarguable fact that not only do they have an important role as an integral part of the human existence, but they are also rapidly becoming an incredibly popular pastime for many, many people the world over. Road trips – long seen as the journey part of a vacation – are becoming much more than they used to be and instead of being but a fraction of the entire vacation, they ARE the vacation, with friends and/or family journeying on the open roads in their vehicle of choice, experiencing nothing but the good times and what whatever the road may have in store for them. Also, in the blogosphere, you even have the increasing prevalence of road tripping blogs (much like this one, in fact! 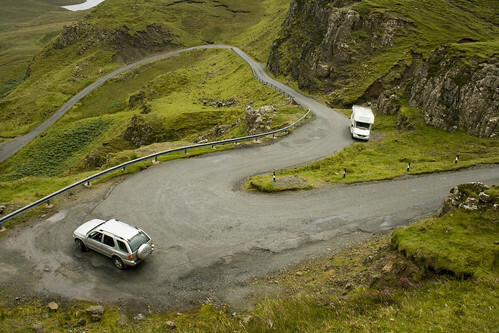 ), which is just one indication of how increasingly popular the activity of going on road trips is becoming. Here you have a number of bloggers not telling you about their vacations in exotic locales, but rather the details and planning that go into their road trips and then when that part is over, you’re informed of the journey and just the journey, because we all know that the journey IS the road trip. If you happen to be inclined to embark upon a road trip of you own, then you shouldn’t look for an excuse or a reason to go on a road trip, you should just GO. Carpe diem – seize the day – and make the most of what life has to offer by going on a road trip with some good friends. You’ll be the envy of everyone you’ve temporarily left behind, because you’ll be out on the open road, living life in precisely the way it was meant to be: exactly the way you want, uninterrupted. For more travel tips and vacation inspiration, check out the Tripbase Travel Blog / Tripbase site. Tripbase was named Top Travel Website for Destination Ideas by Travel and Leisure magazine in November 2008. Photo copyright 2007, Jonathan Kalmes, some rights reserved. Just wanted to give you a quick update on the site here. It’s not really “public” yet, so don’t expect a ton of updates. A few of you have gotten preliminary notices and have found us here, and you’re welcome to stick around. But, I’m going to wait until I have some more content built up before I “publicize” it and start spreading the word. Also, I got a ton of spam on my other site, so I’m using a different anti-spam process here. Hopefully you won’t even notice it, but if it gets in the way let me know and I’ll make some adjustments. That’s our new little beastie. She’s a 30 foot Fleetwood Storm with a Chevy Vortec gasoline engine. Fridge, stove, air conditioner, water heater, generator, vent fans, etc. She’s a little faded, but mechanically in great shape. I just wanted to post up a picture for those who have been asking, I’ll have several posts about her a bit later.